WIne experts gave us some of their favorite, affordable sparkling wine and champagne options. 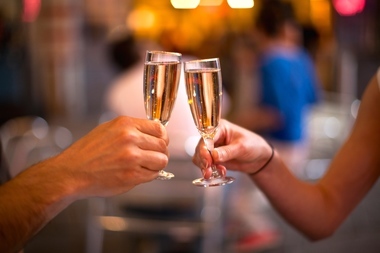 NEW YORK CITY — Whether it's Champagne, cava or prosecco, sparkling wine is the party essential of New Year's Eve. We asked wine experts to recommend affordable fizzy libations you can feel proud to bring to any party. Only sparkling wine from the Champagne region of France can be given the name Champagne. It's often more complex than other bubbly wines, and tends towards the pricier end of the spectrum, with baseline prices at about $30 to $35, and high-end bottles going for hundreds or thousands of dollars. André Clouet, Grande Réserve Brut ($35 - $45): The Champagne, made from harvested pinot noir grapes, has notes of toasty apples with a mineral finish, Colwell said. Poillot NV Extra Brut Reserve Polisot ($39.99): This “finely textured” libation is a “fresh and delicious value Champagne” says Ariana Rolich from Chambers Street Wines. If you want get that “Champagne method” complexity, without the higher prices, a sparkling wine from a different region of France is a cheaper option that doesn’t sacrifice quality, experts said. If you see wines labeled “cremant” that means a French sparkling wine made using the Champagne method, but not in Champagne. Pinon, Francouis NV Vouray Brut ($21.99): This “crowd pleaser” Champagne alternative is from the Loire Valley, Rolich said. Belluard Ayse Brut Perles Mont Blanc ($25): This sparkling wine is an “absolute steal” for the quality and flavor, said Alejandra Guanipa, a wine associate at Slope Cellars in Park Slope. It’s bright and floral. If you want some of that Champagne feel, but don’t want to go above $15, Cava, a sparkling wine from Spain, is your best bet, experts said. Cava uses the same double-fermentation process as Champagne, giving it that rounder complexity of flavor. Castellroig NV Cava Brut ($12.99): This is a “remarkably deep and satisfying” sparkler, according to Rolich. Totus Tuus ($15): This one's a “fun” cava with deep flavor that’s a bit nutty with a taste of grapefruit peel, said Guanipa. And then there’s prosecco, Italy’s lighter, often sweeter sparkler. This wine is usually made by adding CO2 gas, instead of a second round of fermentation, which leaves it with arguably simpler citrusy flavors. Primaterra Prosecco ($9): Experts at Astor Wines recommend this prosecco on its own or to add fizz to your cocktails. Giol 2014 Prosecco Sur Lie ($15): This bottle is a favorite of Chambers Street Wine, and is also one of the rarer proseccos that uses a second fermentation to create the bubbles. Rolich said it's still light and fresh, but with a more complex flavor than many proseccos.